Fracturing a scale in this way allows you to get away from just running the scale up and down. You’re isolating small bits of the whole scale and then either using the splinters individually or combining them. It makes you play the sound differently. Plus, if one of the splinters doesn’t sound particularly amazing, you can move it along in minor 3rds until it sounds good. 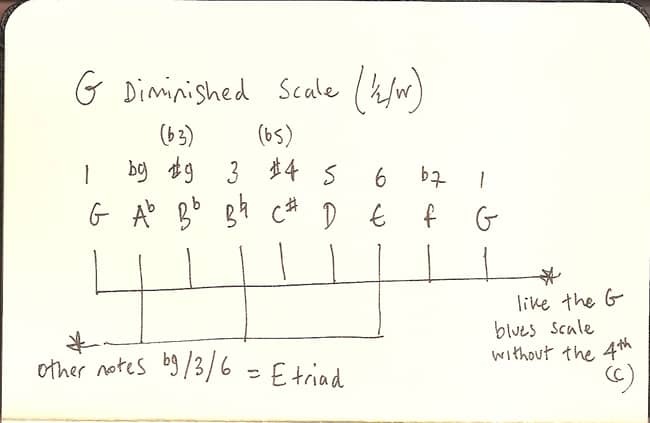 E.g., Instead of the fractured G Blues scale, you could try the same sound starting from Bb, Db, or E.
It’s fun to try to put these things into context and then see if you can see some connections. Like maybe for G7 to C minor, you could try the Db fractured blues scale over the G7, then C min pentatonic over the C minor. It’s an easy thing to remember because those two things are a semitone apart. Another way to see it is that you’re a semitone above the resolution point. There are TONS of patterns and interesting little connections to use like this! Can you see any other ways to fracture the diminished scale?